How do you bring back an ailing downtown in a fast growing suburban community? 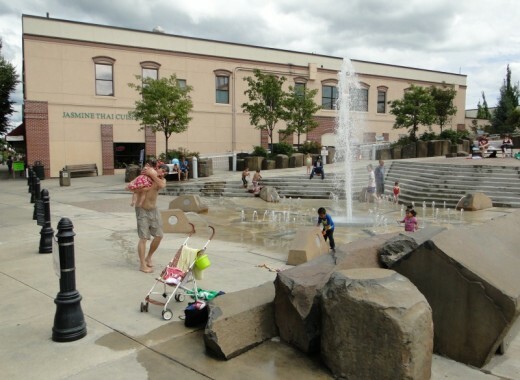 The answer for Hillsboro, Oregon, located about 17 miles west of Portland, lies in arts and culture. Hillsboro is a large (23.76 square mile) community, at the western end of TriMet's "blue line" -- one of the metro area's light rail lines. 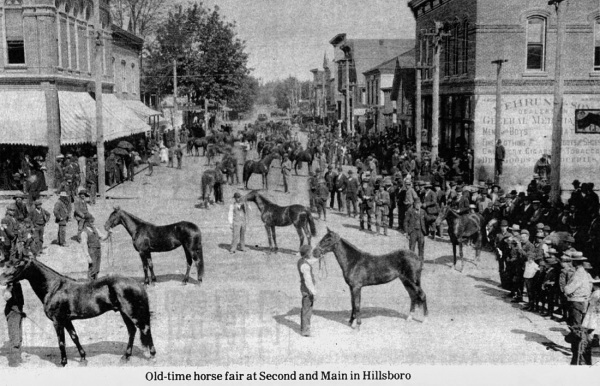 Postcard image of horse fair at 2nd & Main in downtown Hillsboro. 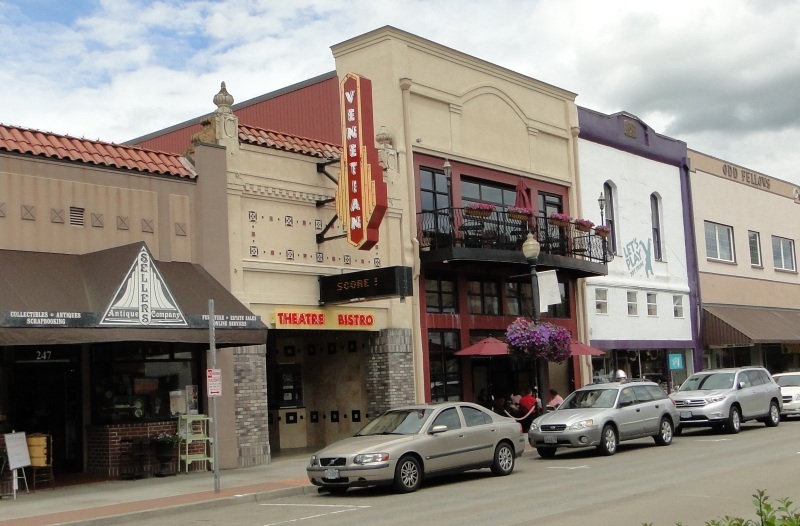 As Assistant Planning Director Colin Cooper, AICP, explained at the International Making Cities Livable conference, Hillsboro is actually an old city (by Oregon standards), incorporated in 1876. For years it served not just as the county seat for Washington County, but as a regional agricultural and lumbering center. 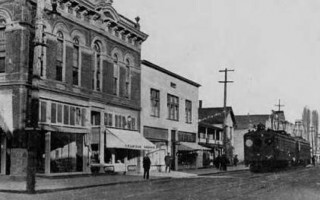 The Oregon Electric Railway provided rail service between Hillsboro and Portland from 1909 until 1932. It was another 66 years under the connection was restored with TriMet's light-rail service. Source: The Oregon Encyclopedia. 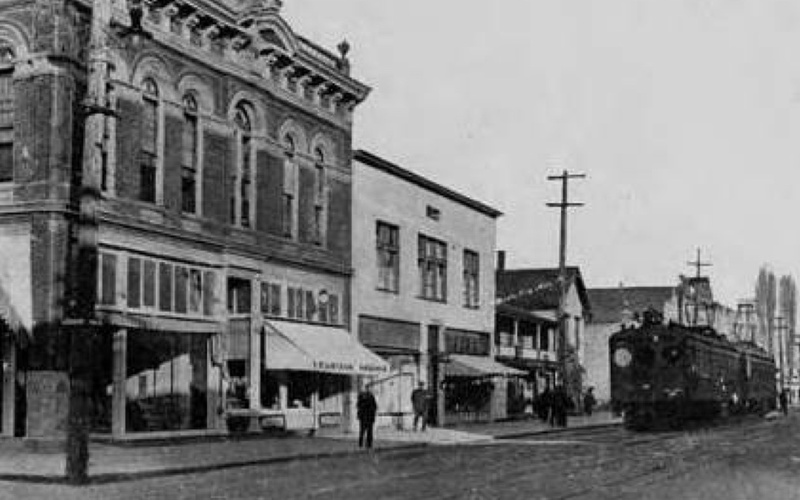 It had a busy, prosperous downtown -- even served by interurban rail. He showed us several postcard images of Hillsboro back then. But since the 1970s, Hillsboro has rapidly grown. Today its population stands at 95,000 (up from 15,000 in 1970 and 38,000 in 1990). What's more, by 2035, Metro -- the regional planning agency -- estimates a population of over 133,000, with more than 113,000 jobs located in the city. Hillsboro is also home to a diverse population, with over 30 percent non-white --- largely Asian and Latino. What's driven the growth? Mainly the influx of high-tech industries. It started in 1976 with the opening of a large Intel facility, and has continued pretty much unabated. In fact, Cooper noted that Intel's workforce at its Ronler campus in Hillsboro (one of three Intel campuses in Hillsboro) is expected to increase from 10,000 to perhaps as many as 17,000 in the near future. For a news story about the expansion. Add in major facilities for Genentech, Epson, Adobe, TriQuint Semiconductor, and Solar World -- a major manufacturer of solar panels, and a number of smaller firms (see the full roster of employers on Wikipedia). Where will all these new workers be housed? That's one of the big challenges facing the city -- in part because Hillsboro is constrained on three sides by the metro area's urban growth boundary. "We're hoping," Cooper explained, "for most of the new housing to go into transit-oriented development -- TODs -- and into our downtown." 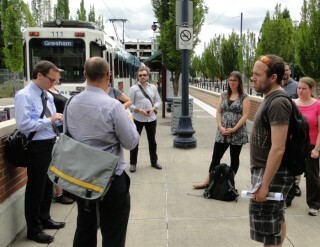 IMCL conference attendees arriving at the downtown / government center Hillsboro light-rail station. We'll focus in a coming post on Orenco Station, one the largest TODs not just in Hillsboro, but in the United States. But today, I want to fill you in on Hillsboro's downtown strategy. 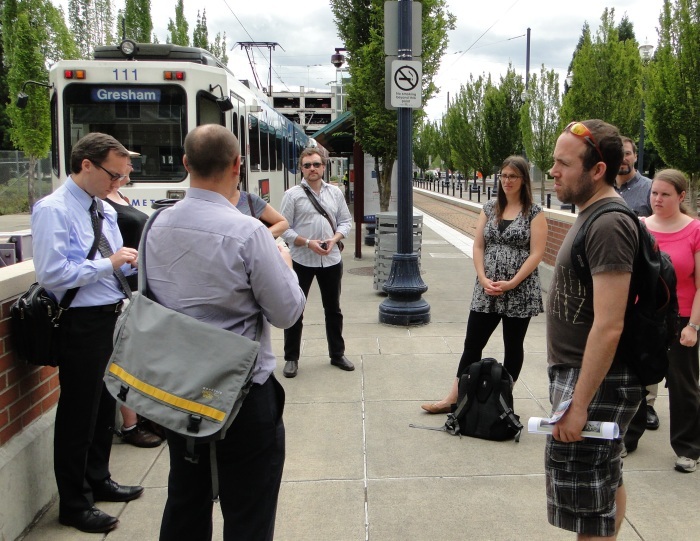 A dozen of us attending the IMCL conference spent an afternoon walking through downtown Hillsboro, guided by Hillsboro urban planner Dan Rutzick, and Karla Antonini, AICP, the city's Downtown Project Manager. Karla Antonini and Dan Rutzick in front of giant sequoia on grounds of the downtown courthouse. 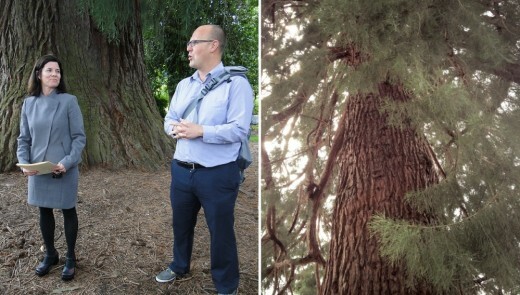 These giant trees were planted in the 1880s. One of the challenges facing Hillsboro is that its downtown is quite spread out. See a portion of the comp plan map below. 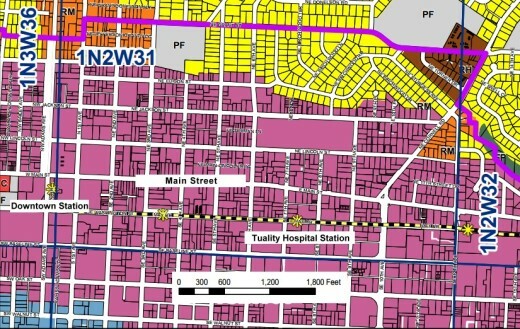 Segment of Hillsboro's comp plan map. 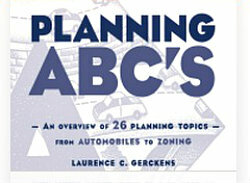 Click on image to view it at larger size. The light purple identifies part of the downtown district. The * symbols show the location of the light rail stations. 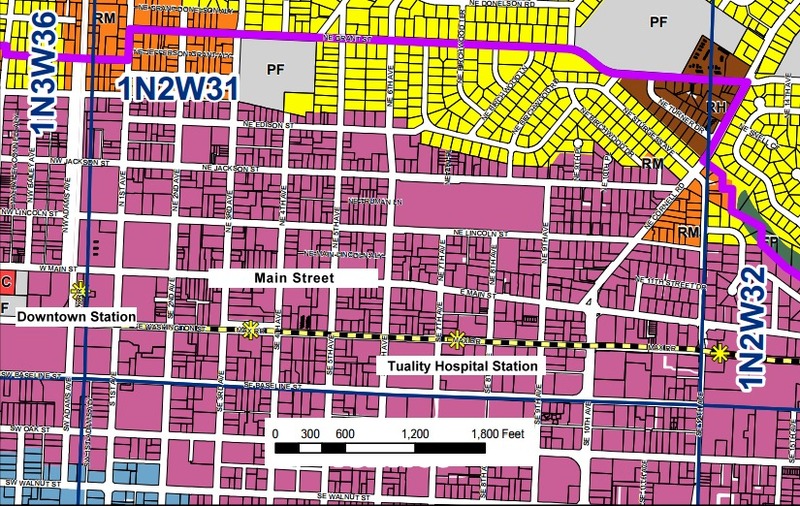 It includes not just a four block "Main Street" commercial district (primarily between North 1st and 4th Avenues), but also --about a half mile and two light rail stops away -- a major health care hub, including Tuality Hospital and the expanding campus of Pacific University's College of Health Professions (with programs in areas such as dental science; pharmacy; optometry; audiology; and physical therapy). 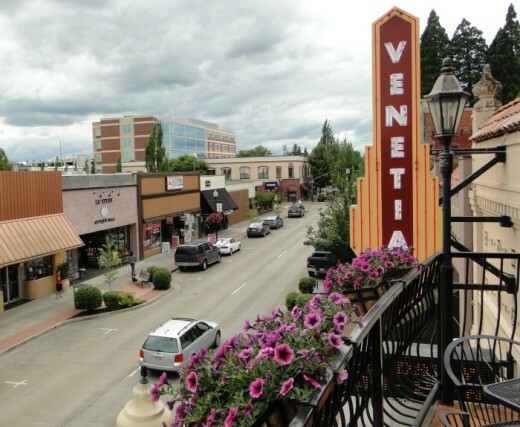 View of part of the Main Street commercial district from the balcony of the Venetian Theater. The large building two blocks down the street is the Hillsboro Civic Center. Views of the health campus, near the Tuality Hospital light rail stop. 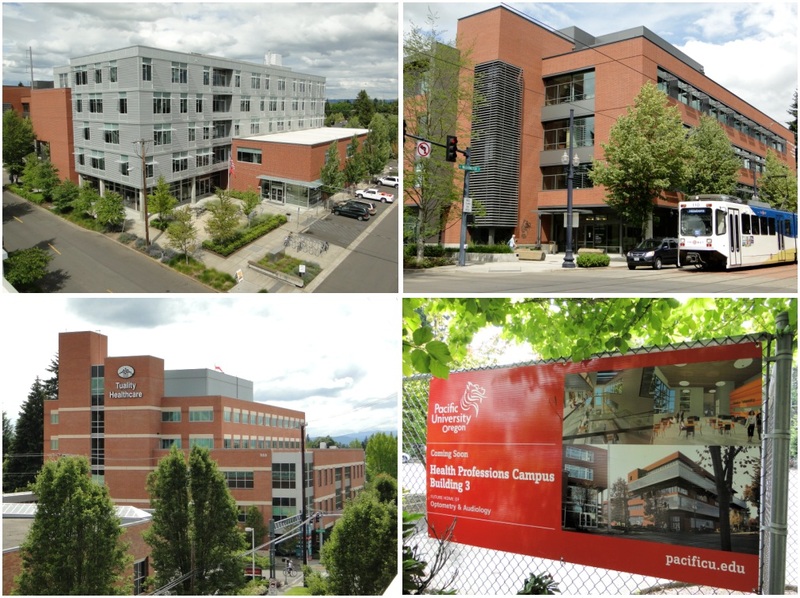 Top row are photos of Pacific University; bottom left is Tuality hospital; bottom right is sign announcing construction of another building by Pacific University, directly across from the light rail stop. Photos by Wayne Senville. As Rutzick noted, "about 12,000 people work in downtown, but it's a very large downtown." In recent decades the commercial corridor has faced disinvestment," he told us. "The city," Rutzick continued, "through an intensive planning process [the Downtown Hillsboro Renaissance Project] completed in 2007, decided to focus on creating an arts and culture district in downtown." Also critical to downtown is the MAX light rail line, which opened in 1998, connecting several of the region's western suburbs with Portland. 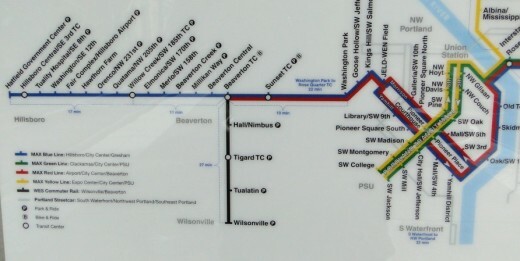 Its western terminus is the downtown Hillsboro/Government Center station. 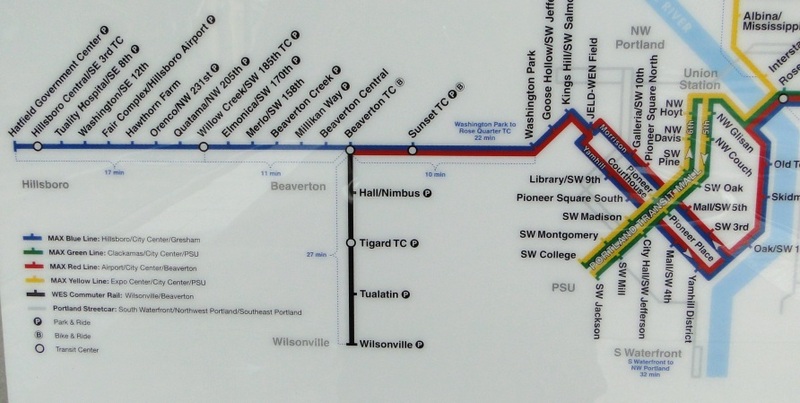 Part of TriMet rail map; Hillsboro's downtown / government center station is the western terminus of the line. Click on the image to view it at larger size. 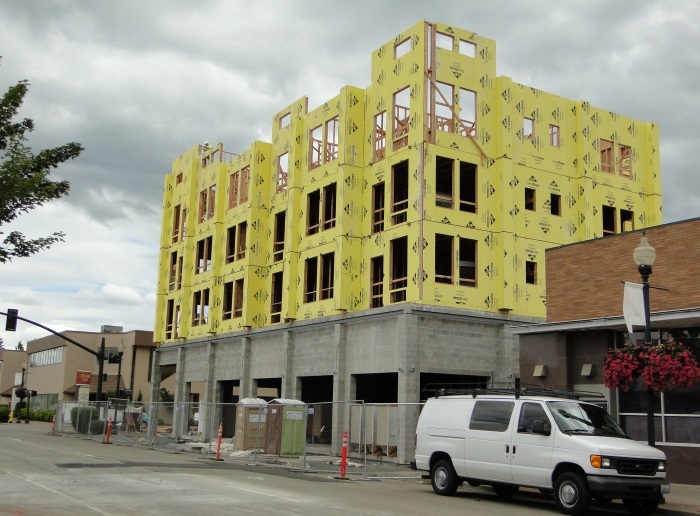 While it has taken some time to get rolling, downtown Hillsboro has been seeing increased activity, and new housing. For Hillsboro's planners, the arts and culture focus is key. As Rutzick explained, "Having an arts and culture district will draw people to live downtown; this is what will set downtown apart." Venetian Theater in downtown Hillsboro. 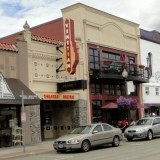 -- The re-operning of the historic Venetian Theatre (with a bistro on the ground floor). The City bought the building back in 1998 for $1,500, and it's finally paying off. 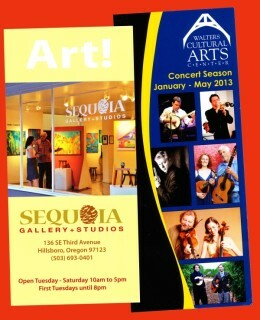 -- Sequoia Gallery & Studios opened in 2008. According to Antonini: "The City paid for the tenant improvements and the property owner leases the space to the City at a discounted rate. The City passes this reduced rent along to the non-profit artist organization that runs Sequoia." -- Creation of a 15-member Arts & Culture Council. As the Renaissance project report notes: "This is a crucial step in building local organizational capacity to move forward. In many communities, local arts councils are important catalysts in shaping and shaking the arts scene." -- Formation of a downtown urban renewal district to help provide a funding source for new capital investments downtown. -- Creation of an Arts Center, in what used to be Lutheran Church. Managed by the city's Parks & Recreation Department, it includes classrooms and studio space. 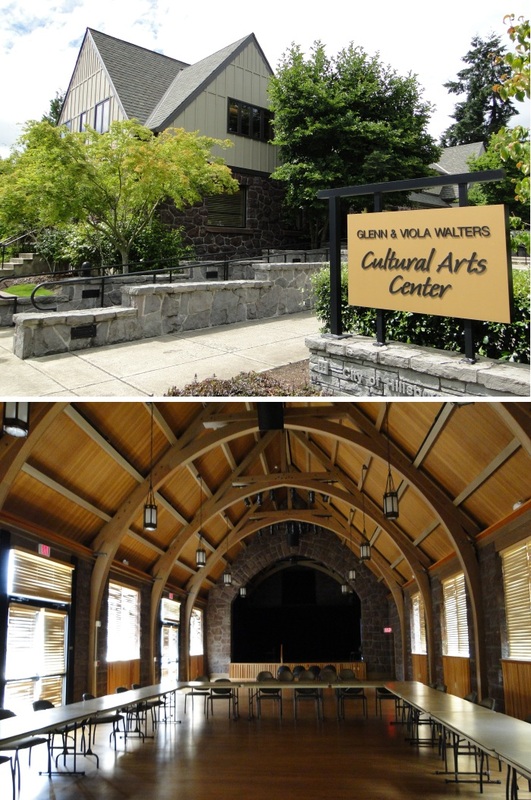 The Walters Cultural Arts Center is housed in a former church. While not directly arts related, the new 120,000 square foot, LEED-gold, downtown Civic Center, helps anchor the downtown, with space for city employees, as well as the Washington County Science Museum and an indoor children's play space. The plaza and fountain in front of the Civic Center are a big draw on warm, sunny days. Challenges remain. One, s the large size of the downtown, with the health campus nearly half a mile from the commercial heart of Main Street -- making it difficult for workers at the hospital or university to get there during lunch break. Another, as Antonini pointed out, is the fact that the two main roads traversing downtown operate as a one-way pair. "Having one way streets makes it harder to develop an arts and culture district, as drivers find it more confusing to find places." I'd add a third -- the fact that there are still many other attractive living opportunities in Hillsboro -- including the Orenco Station TOD, which I'll be discussing in an upcoming post. But with the combination of a tight urban growth boundary -- preventing new development from sprawling into adjoining farmland -- a fast growing population, excellent light rail service, and an emphasis on arts and culture downtown, planners are counting on downtown Hillsboro being "discovered" as a place to live. Will the soon-to-open 71 unit 4th & Main building will be the precursor to other downtown housing projects? 4th & Main is under construction. It will include 71 market rate apartments, plus commercial uses on the ground floor. The City's downtown TIF (tax increment financing district) has helped make this project financially feasible. One market for the housing is the growing population of faculty and students at nearby Pacific University. One other interesting note: according to Dan Rutzick, part of deal with the developer is that he has to put an active use into the former bank building next door (partially visible on the far right of the photo). I've got to make sure to pay a return visit, say, ten years from now to see the shape of Hillsboro's "new" downtown.